John Travis became Of Counsel in January of 2018. He previously served as Gallagher Sharp’s Insurance Practice Group Manager and was active in the firm’s General Litigation Practice Group. 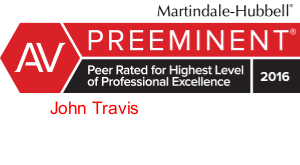 John was certified as an Insurance Coverage Law Specialist by the Ohio State Bar Association and focused his practice on counseling and representing insurers in coverage and property matters, including those alleging bad faith and involving fire losses. John is past Chair of the Cleveland Metropolitan Bar Association (CMBA) Insurance Law Section and was active in the Ethics and Unauthorized Practice of Law Sections. Additionally John defended clients in a wide variety of general litigation claims, including municipal law and personal injury matters.